Hen & Stag Weekends at Hawk Adventures Hen & Stag VenueAs well as organising your party's outdoor adventurous activities, we can also help with finding suitable accommodation in the South Wales area. We offer the perfect adventure element for those looking for a bit of excitement before the big day. 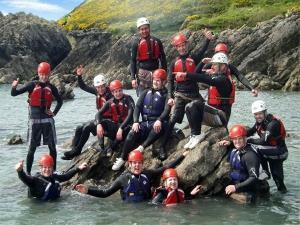 Climbing, Abseiling, caving, Coasteering and Gorge Walking are all popular with our Stag and Hen groups.